BOXING LEDGER | LATEST BOXING BLOGS | BOXING ARTICLES | BOXING BLOG FIGHT: Griffin-Mack IBF Eliminator tops “New Years Bash” January 7! Griffin-Mack IBF Eliminator tops “New Years Bash” January 7! 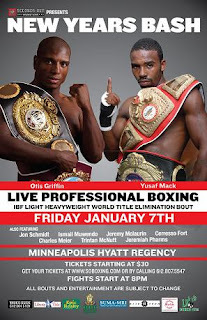 Minneapolis, MN (December 27, 2010) – USBA Light Heavyweight titlist Otis “Triple OG” Griffin and Yusaf Mack will battle it out to become IBF champion Tavoris Cloud’s mandatory challenger when they meet Friday, January 7 in the main event of “New Year’s Bash” from the Hyatt Regency Hotel in Minneapolis. The card is presented by Seconds Out Promotions in association with Brewer Sports International and tickets start at $30. Griffin, who won Oscar De La Hoya’s reality show “The Next Great Champ” owns a solid 23-6-2 pro ledger with 9 wins by way of knockout. The Sacramento, CA native has shared the squared circle with the likes of Danny Green, Jeff Lacy, Marcus Oliveira, Enad Licina and Jesse Brinkley. 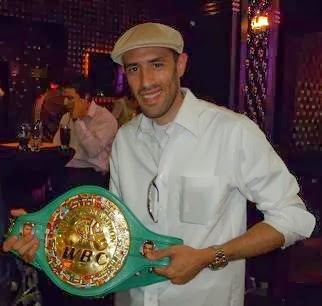 Last May, Griffin won the USBA belt with a shocking eighth round knockout of two time WBA Super Middleweight champion Byron Mitchell. Mack, 28-3-2 (17 KO’s), is universally recognized as a player in the light heavyweight division that has fought some of the world’s best. Born and bred in the fighting city of Philadelphia, PA, Mack holds impressive victories title challengers Chris Henry and DeAndrey Abron while falling just short against Glen Johnson, Alejandro Berrio and Librado Andrade. Griffin-Mack is scheduled for 12 rounds. Unbeaten junior lightweight Ismail “Sharp Shooter” Mudendo will look to move to 8-0 with 7 knockouts when he faces an opponent to be named in the six round co-feature. The Minneapolis based Ugandan is regarded as one of the Midwest’s best prospects and at age 22 has plenty of time to develop. Also appearing on the undercard will be former amateur star Javonte Starks (4-0, 4 KO’s), Charles Meier (4-1-1, 2 KO’s), the pro debuts of Mellissa Littlejohn and Tristan McNutt in separate bouts and two mixed martial arts featuring local favorites. Tickets can be ordered by going to soboxing.com or calling 612-807-5547. Doors open at 7pm and the first bell is scheduled for 8pm.